The team pictures had come off the walls. The Maui Invitational surfboard had long been carted off along with various pieces of memorabilia accumulated over 20 years. About the only thing Riley Wallace left behind before closing the door to his office was a tall bottle of Tylenol. 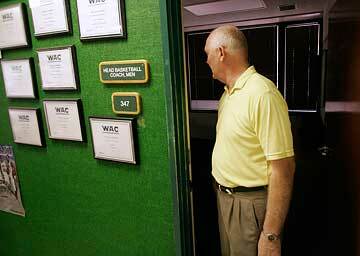 "That's all I'm leaving you," Wallace said to Bob Nash, his longtime assistant and successor as head coach of the Hawaii basketball team. "And it's heavy duty." With Nash already immersed in some of the duties -- and inheriting many of the headaches -- that go along with taking over a Division I basketball program, Wallace's tenure officially ended yesterday, his final contract coming with an expiration date of April 30. His last day at the office was much more low-key compared to the sendoffs he was given as his retirement from coaching approached after 20 years as UH head coach. There was the emotional postgame ceremony following his final home game at the Stan Sheriff Center and recognition at the Western Athletic Conference tournament in New Mexico. Last week alone, the athletic department's coaches and staff held a coffee hour in his honor, he was roasted at the Honolulu Quarterback Club, and a farewell dinner raised $200,000 for the Riley and Joan Wallace endowed scholarship. "It's time so he can enjoy what he and Joan have worked so hard for," Nash said. "I think he's in a great position right now because he can enjoy his wife and kids and grandkids. ... It's been a great sendoff, it shows the friendships he's built over 20 years." 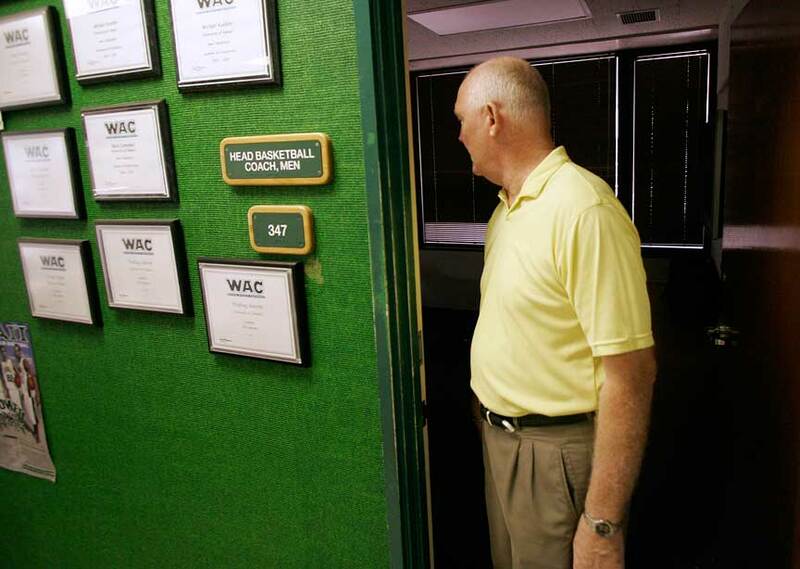 Part of Wallace's last morning as head coach was spent walking through the athletic department taking care of some final paperwork and greeting staff members along the way. He then took the elevator back to the third floor to pick up a last handful of his belongings. "What am I going to do tomorrow? That's the big question," Wallace asked with a shrug before recalling his schedule for May 1. "Oh I know, I'm going to play golf." After shaking hands with Nash and giving secretary Bobbie Omoto a hug, Wallace headed for the door, choking back emotion as he exited the building. "My wife is calling every 2 hours, going, 'Are you doing all right?' " he had said moments earlier. WITH THE END of one tenure comes the start of another. But for Nash, May 1 won't be much different than any other morning. "I'll just walk in the door and turn the key like I always do," he said of his first official day as coach, "get on the computer and start answering some of the e-mails and watch the day go from there." As Wallace decides on his next step, Nash's free moments have been a precious few since moving up a rung to head coach after serving as associate coach for the last 20 years. Since his introduction as the program's 18th coach on April 13, he's been playing catch up on recruiting while working on the schedule for next season. Then there's the other requisite duties ranging from making sure players are set up in summer school to getting ready for the program's annual summer camp. "As the summer comes around it'll start to spread out a little bit, but right now there's just a lot of things packed into basically a 3 1/2-week period where we have recruiting, scheduling, staffing, all those things," Nash said. "All those things happen all at once. It's not like you get to bring them in slowly. You just have to work through it one at a time and that's what I've been doing. I'm trying to work through it as effectively as possible, but not to rush into anything where I make mistakes. "He's clipped our wings and now it's time for us to fly on our own. He can look back and see what he's helped build and see if we can keep this program moving in the direction he steered." Recruiting is the main thrust at the moment with point guard and big men among the top priorities. The Rainbows have four scholarships to offer for next season with the late signing period running through May 16. One thing Nash isn't in a hurry to accomplish is moving next door into the corner office. "I'm not in any real rush to get into that office," he said. "I've got plenty of time to do that."